Weathering is a delicate balance to say the least. Too much or too little and you miss the mark. Learning how and when to say enough is enough can be a challenge. But I think even more importantly than the amount of weathering you do is how you start off the whole process. 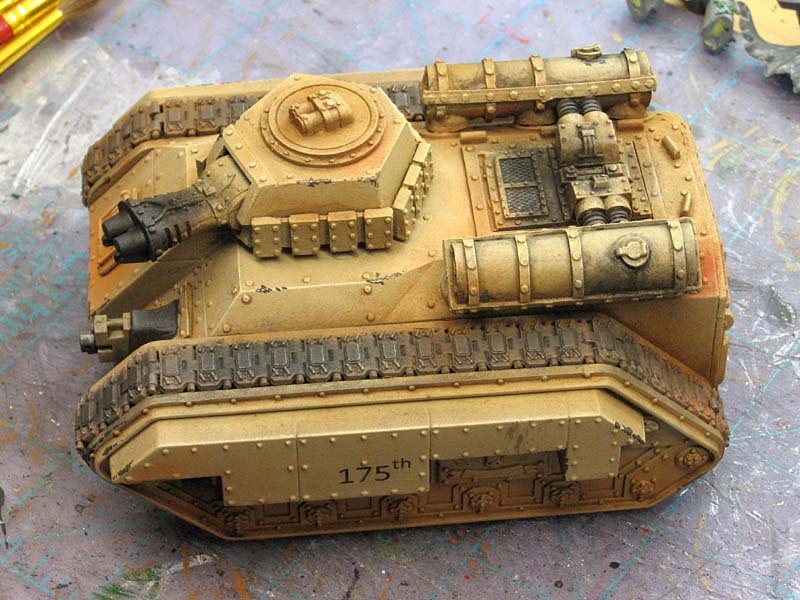 While it might seem counterproductive, I think the best weathering results come when someone paints the model or specific portion of it to look like it would without any damage or battle scars and then go from there. Since we are trying our best to duplicate an effect seen in real life on an insanely smaller scale, we'd do best to take our time and try and be as "accurate" as we can so that we are convincing. We will have true to life scale weathering? Not likely, as you may not even see the scratches and such if we did that. But if we try and shortcut it, we can potentially kill the illusion without even trying. 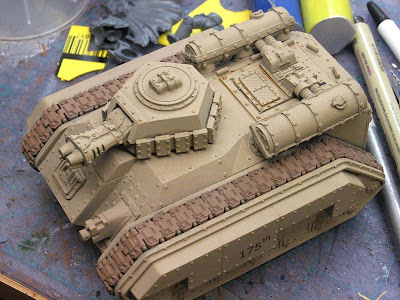 By starting with a model that is primed and based in the colors it would be if it were "undamaged," we help with making sure our weathering illusion is correct. I can add the soot stains where they should be without having to worry about what's underneath since it's already "correct" without the stains. If I add things like semi-transparent oil stains, they come out looking the way they should because I have the right color underneath them. 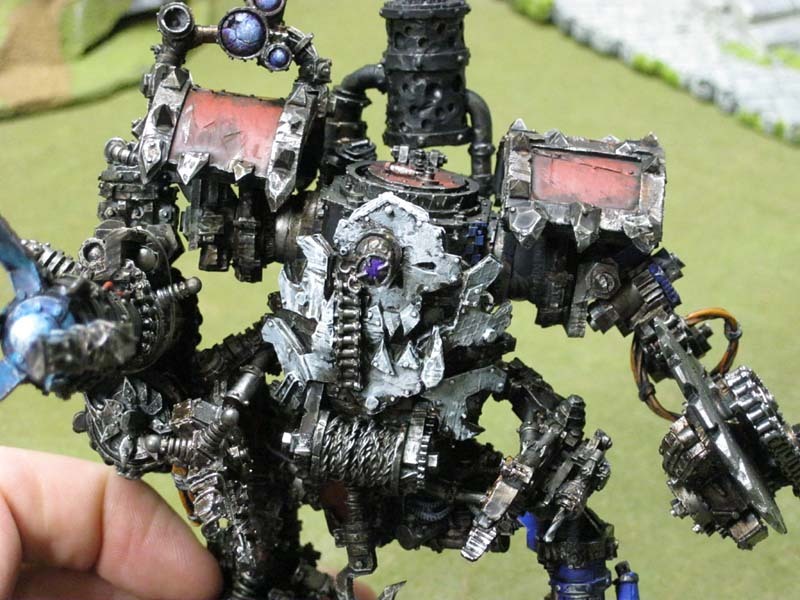 So we skip over to my friend's Ork Dreadnought and we look at the face of this guy. This guy was painted by drybrushing the white for his face over the top of the darker basecoat. This might give us a "worn" look real quick, but it's not correct in it's application and to most folks, it doesn't look right or it looks like it's missing something. It's not missing something, it's just that the colors are backwards. Does it work... kinda, but not as well as it could if we flip the colors and paint the face a solid white first and then add our weathering to it after that. Done the way it is... the damage is in all the recessed areas and the still clean (white parts) are all the raised areas. That's counter to how things are damaged. It's the raised areas that get damaged in real life. It's the things that stick out that get scratched up and worn down. If we were to start by painting his face a nice, smooth white color to start with, we could add our weathering on top of that in the "correct" places. 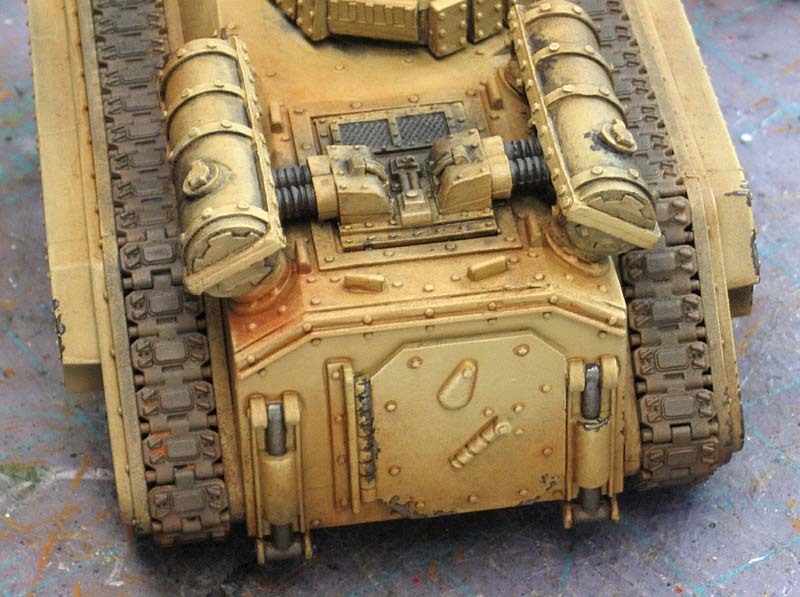 Then the addition of drybrushed "chipped paint" would be correct since we'd be adding it to the upper, more prominent edges on the face and not the recessed areas where we would have things like rust and oil collecting instead. Sure, deep grooves in armour plates cut down into the metal and leave it exposed, but not everything is a deep groove. 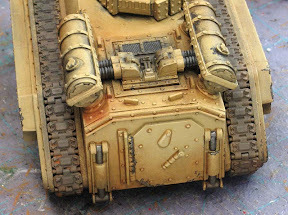 By painting an object (like the Ork Face there) the correct color to start with, our drybrushing of surface damage is kept to the areas it should be, our semi-transparent effects like stains and such allow the original color to show through and we have much more convincing weathering results in the end. Here's a good example, how well would this model have worked if I painted him a metal color and then drybrushed the black on him to represent the paint on his armour? The black would have ended up covering all the places tat the metal should be showing... the outer edges. Instead, by painting him the "correct" color first, I avoid that whole issue. 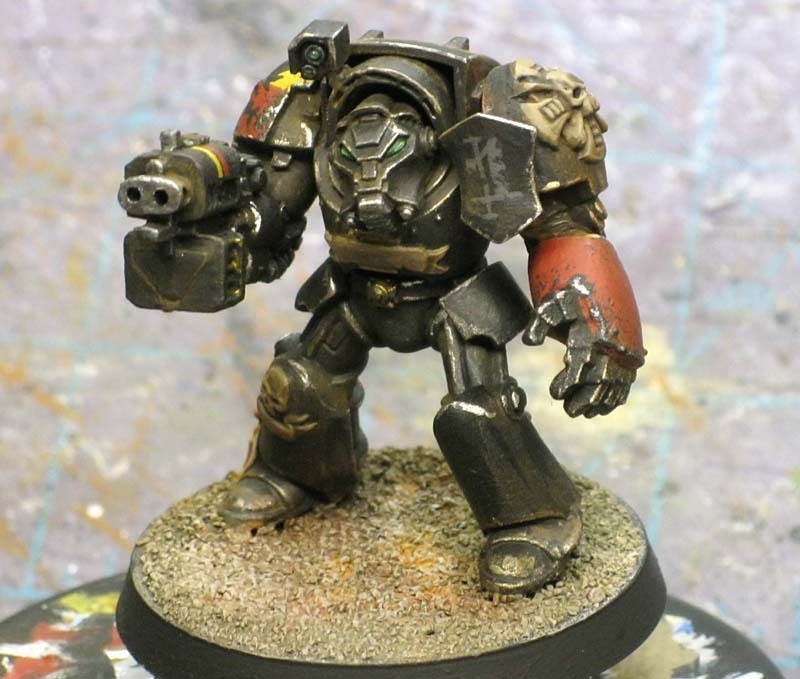 By painting him as though he had no battle damage and then taking an additional step and adding it in key places, the effect is much more convincing. Some effects can be done quickly, others take some time. I frequently need to remind myself not to take the lazy approach as it so often looks worse/wrong. It all depends on what you're trying to do. Sometimes, it's not bad to just "get it painted."